Educational Testing Service (ETS) is a US based non profit organisation, and has become the world leader in Educational Assessment since its inception in 1947. There are offices and representatives throughout the globe, dedicated to optimum service to students and institutions in their quest for educational development. The staff at Pro-Match come from the professions including Psychology, Teaching, Information Technology, and Management, and we will do everything possible to provide a timely, courteous, and efficient service. 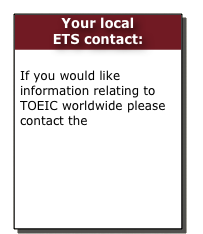 See www.ets.org for more information.